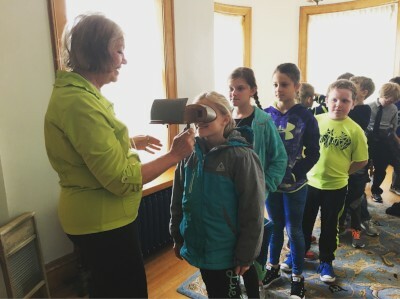 The Joslyn Castle’s Children’s Program, “Discovering Violet’s World” presents tours geared toward our younger visitors, ranging from 8-11 years old. We extend an invitation to discover what life was like for children growing up in the 1900s, through the eyes of the Joslyn's daughter, Violet. We welcome children from Omaha area schools, churches, and home school groups this opportunity to tour the historic Joslyn Castle and learn its history. The intention of this program is to enhance the curriculum for students who are studying Omaha and Nebraska history by providing an opportunity to experience what life was like in the early 1900s from a child’s perspective. In their hour and a half visit to the Joslyn Castle, students are guided through the Castle on a tour designed especially for them. In addition, they are welcomed to explore the ‘Discovery Trunk’ which is filled with items commonly used at the turn of the century. From a crumb catcher, cast iron ice skates, to an ink well, the students are sure to see something new, but old. Schedule your Violet’s World tour today and help bring the past back into the present for your kids. Is your Tour Date Flexible? Questions regarding School tours? Call the Joslyn Castle tour line and a staff member would be happy to assist you!